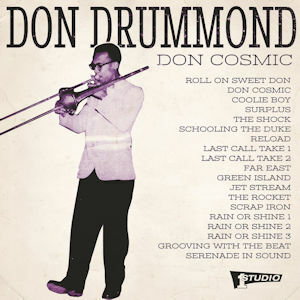 Interesting Don Drummond CD with 17 Ska and 2 jazz tracks (Grooving with the Beat and Serenade in Sound ) from early to mid sixties. The ska instrumental Last Call issued as a 45 on Studio One blue label, an original would set up back many hundreds of pounds! All are recorded at Federal and Studio One produced by Clemont Dodd. Collie Boy, Surplus and Far East (Further East) are all so on the Skatalites - Independence Ska and Far East Sound Soul Jazz Records CD. Song notes by Clemont Dodd and Chris Wilson. Issued on Coxone Records/Studio One Yep Roc Records SOR-004 USA.